The 21stth annual Hannes Schneider Meister Cup Race at Mount Cranmore will kick off Friday evening March 10 with a twilight ski ascent of the mountain for skiers on alpine touring and telemark equipment, with a hearty buffet in the Eating House following their nighttime descent. Eastern Mountain Sports of North Conway will provide alpine touring demo equipment from Dynafit, G3, Black Diamond and K2 for those who need it, included in the $25 event registration. Participants who want to take advantage of the demo offer should call the EMS North Conway store at 603-356-5433 to reserve gear or visit the store before 5 PM on Thursday March 9, 2017 so that their equipment can be properly sized. 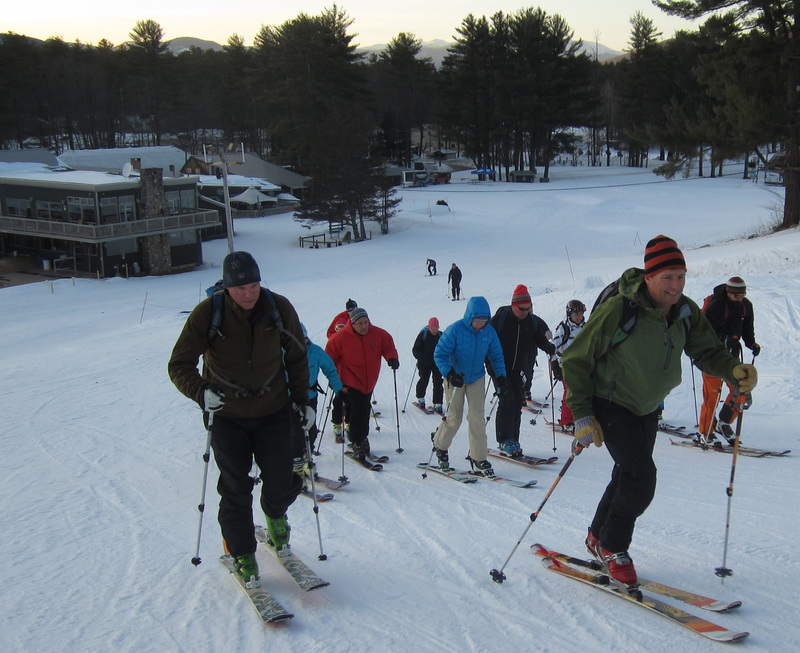 EMS Twilight Alpine Tour skiers set off for the 1,200 foot ascent of Cranmore in 2015. Registration for the EMS Twilight Alpine Tour begins at 4:00 PM on Friday March 10 in Zip’s Pub and costs $25, including the dinner buffet. Beginning about 5:15 PM, tour participants will ascend the 1,200-foot vertical rise to the summit, then relax in the Meister Hut, which will be open with hot chocolate available to the group. Skiers will be back at the base by 7:00 PM in time for the hearty alpine buffet that coincides with the opening reception of the Meister Cup in Zip’s Pub and Grill. The connection between Hannes Schneider, the legendary figure honored by the event, and the use of skis for climbing and, is clear and direct. Schneider developed his ski instruction techniques decades before the invention of ski lifts, and of necessity he used uphill ski climbing techniques daily himself and taught them to his students in his native Arlberg region of Austria. 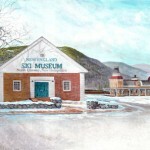 Schneider’s 1939 arrival in North Conway to assume the directorship of the ski school at Mount Cranmore came just as uphill ski techniques were falling into disuse because ski lifts were becoming widespread. Today, the sport of alpine ski touring is seeing renewed popularity. The use of climbing skins and free heels for climbing on skis was also an everyday part of life for the soldiers of the 10th Mountain Division as they trained in the mountains of Colorado during the winters of 1943 and 1944. The Hannes Schneider Meister Cup commemorates the contributions of the veterans of the 10th Mountain Division to the postwar US ski industry, and several 10th Mountain veterans are expected to attend. Events at the Meister Cup on Saturday March 11 include the opening ceremony at which Executive Councilor Joe Kenney and Representative Gene Chandler will welcome spectators, as the national and 10th Mountain Division colors are posted. The dual giant slalom race is held on The Alley, gentle terrain for skiers and snowboarders, and the vintage ski fashion show, silent auction and music by the crowd-pleasing Bavarian Brothers Band appeal to racers and spectators alike. Race entry cost is $75 per person or $375 per 5-person team, and registration forms are available at Meistercup.org or by calling the Museum at 800-639-4181. The Opening Ceremony begins at 9:15 AM. There is no charge to be present as a spectator and all who are interested are strongly encouraged to attend. The sponsors who make the 21th Annual Hannes Schneider Meister Cup Race possible are Cranmore Mountain Resort, World Cup Supply, the Connie Davis Watson Foundation, the Schneider Family, New Hampshire Distributors, Eastern Slope Inn and Resort, the Conway Daily Sun, Eastern Mountain Sports, Magic 104 FM, 93.5 WMWV, Valley Originals, and Hill’s RV.